CHANGCHUN: Chinese archaeologists have discovered a section of ruins of the Great Wall of Qin (221 BC and 206 BC) and Han (206 BC and 220) dynasties in northeast China's Jilin Province, which proves the defensive wall stretches eastward further than previously thought. "The site was found in Tonghua County, Jilin, 10.9 km eastward of what was previously thought to be the eastern end of the Great Wall in Xinbin County in neighboring Liaoning Province," said Zhao Hailong, head of the Great Wall resources research team in Jilin, on Tuesday. He said the team's research was a part of a national project to measure the length of the Great Wall of the Qin and Han dynasties. The project is jointly sponsored by the State Administration of Cultural Heritage and the State Bureau of Surveying and Mapping. 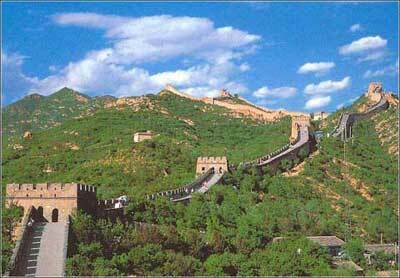 It is generally believed that the Great Wall was built in different historic periods and adds up to about 50,000 km. The two government departments announced in December 2008 the exact length of the Great Wall built in the Ming Dynasty (1368-1644) was 8,851.8 km, after conducting a first phase national survey of the Wall. Zhao said the archaeological site in Tonghua County was a well-preserved 172-meter section of ruins. It is the first time a section of the Great Wall of the Qin and Han periods has been found in Jilin. A large quantity of Han Dynasty earthenware was unearthed at the site, which has been called by archaeologists the "Nantaizi Relics". "The site is probably a fortification of the ancient city of Chibosong, which is 27.9 km away. It is important evidence of the Han Dynasty's administration of the northeast part of the country, " said Zhao. He said there might be more forts in the 10.9-km distance between the new site found in Tonghua and what was previously thought to be its ending in Xinbin. "However, it is a meagerly-populated area covered by dense forest and it is difficult to conduct archaeological surveys there," he said.